This is a story of injustice – and work for justice. If you travel through South Africa’s Northern Cape grape growing region, the land that you see holds much beauty – but also painful memories of loss. Under the structures built up around colonialism and apartheid, laws passed by white governments dispossessed many non-white families who had land and homes in more valuable parts of the region, forcing them to move. To take one example, in the early part of the 20th century, the Natives’ Land Act resulted in the erosion of rights and eventual dispossession of established ‘Baster’ farmers in the Upington area along the Orange River. Many of the dispossessed farmers petitioned the government “to recognise their original rights again, or, if that was impossible, to grant them another settlement for agriculture and stockfarming on the same conditions.” Instead of being given their original rights – or their equivalent – the group, whom the government labelled as ‘coloured’ farmers, was assigned an alternative ‘reserve’ at Eksteenskuil, where they were given rental rights to small amounts of land. Over the years, the government moved more white farmers from the Eksteenskuil area to better land, and moved more ‘coloured’ farmers into small – often very small – plots. The community continued to develop the area, building canals, roads, and bridges as best they could within limited means. Ironically, though they were making improvements at their own expense, they still did not own the land they were improving; the government continued to insist on renting it to them, without their having proper land rights – a fact which made it very difficult for them to get access to finance. Farming small plots on marginal rented land without access to capital for improvements is not an easy way to success. But in 1994, as apartheid ended and hopes of political and economic transformation grew, the Eksteenskuil raisin farmers came together to found the Eksteenskuil Farmers Association. But how, even working together and operating within a new political framework, would they get the capital to increase their productivity? And how would they access markets? A step towards realising the group’s ambitions took place in 1995 when the Eksteenskuil farmers began to work with Traidcraft, who purchased their raisins via the government-funded South African Dried Fruit Co-operative (SAD), which provides technical assistance and processing/export capacity. Over time, the relationship between Eksteenskuil and Traidcraft evolved, and Traidcraft assisted the group in getting Fairtrade certification and, when it became necessary, in forming a cooperative. Today Eksteenskuil is a fully accredited Fairtrade cooperative of about one hundred farmers living on three island groups namely middle, southern and northern island, exporting its raisins via SAD and Red Sun to a number of buyers. Fairtrade has brought distinct benefits to the farmers. Fairtrade contracts offer a minimum price, which is determined for each Fairtrade product in consultation with farmers and is designed to cover the average cost of sustainable production while allowing access to markets. More significantly in this case, Fairtrade contracts also offer a ‘Fairtrade Premium‘ which, for smallholder cooperatives, goes to the cooperative for investment in business, livelihood and community improvement. For South African raisins, the current premium is R1.82 – about 10p – a kilogram. Eksteenskuil Agricultural Cooperative has used the Fairtrade premium to bring benefits to its members. Using money from Fairtrade’s Technical Assistance Fund and Traidcraft, it’s provided technical training for farmers, many of whom had little access to business education under the apartheid regime. It’s worked to redress the lack of access to machinery and labour that has long restricted productivity, coordinating bulk purchasing of farming inputs, providing small loans to improve access to inputs and hired labour at key points in the farming cycle, and purchasing farm implements such as tractors, ploughs, grass cutters and pumps that members can hire for nominal amounts. To build the business further, it has also invested in the EAC’s structures and administrative capabilities. The Cooperative has also undertaken work that benefits the wider community on the islands. It has built water pumps to allow better access to safe water. Schoolchildren in local schools have received bookbags to protect their materials from rain and dust. At one point the Cooperative gave a grant to start a women’s gardening project, designed to raise both income and nutrition levels, which employed farm labourers’ wives in tending market gardens. Traidcraft also provided support for women’s empowerment initiatives as part of its commitment to offering development support beyond the actual Fairtrade trading relationship. 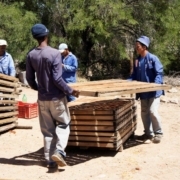 While participating in Fairtrade, the Eksteenskuil Agricultural Cooperative has already survived one major challenge: in 2011, the Orange River flooded, and the vulnerable lands of Eksteenskuil suffered serious damage. Raisins that had already been harvested were lost; vines submerged and killed; and local infrastructure destroyed – the North Island was cut off for three months. For some farmers, the effects on productivity following the flood were also quite significant. Traidcraft, however, remained committed to buying from the cooperative, continuing market access. Vitally, responding to concerns about the community’s ability to finance major recovery projects, the government has rebuilt infrastructure. Longer term questions about vulnerability, however, remain. Nor is natural disaster the only challenge. Eksteenskuil faces competition from Fairtrade raisin producers in other countries. Land tenure remains an issue for some. And there are can be internal questions. Researchers studying the cooperative have reported that the members on the different islands can have different priorities and perceptions. Eksteenskuil must also grapple with a question getting quite a lot of attention in Fairtrade more broadly – in addition to the benefits that accrue to the smallholder farmers, what are the benefits for the labourers those farmers hire? Perhaps the greatest challenge at present surrounds finding buyers. The amounts the cooperative has been able to export have fluctuated not only because of supply issues but also because of demand issues. While Fairtrade purchasing relationships tend to be stable in terms of continuity, UK companies can have their own financial pressures at times, and so their purchasing levels can go lower or indeed cease. Eksteenskuil has been hit badly by Traidcraft’s recent retrenchment, and is now looking for other Fairtrade purchasers – without them, it will be a challenge to continue. But despite the challenges, if you have visited Eksteenskuil, it remains an inspiration. It’s not just the tangible signs of progress you remember. It’s the scale of the organisation: in a country where apartheid regulations and the post-apartheid sociopolitical climate generally have not encouraged historically disadvantaged communities to undertake large-scale cooperative ventures, it’s an extraordinary accomplishment for so many farmers to be working together in the EAC, especially given the physical complexity of Eksteenskuil’s terrain. Its record as a group with access to international markets is still relatively rare and conveys status: as a 2010 paper states, “the sustainable linking of emerging farmers to commercial agricultural value chains remains to be a challenge in South Africa where few success stories exists.” In discussions around working with local, large-scale farmers, some of whom have been very supportive, there’s a sense that the cooperative is establishing a place for itself within the region and the sector. The pride people take in their work and their ownership of it is also notable, as is the concern cooperative members have shown in helping those who are less fortunate, seen, for example, in their support for a local refuge for vulnerable children living with HIV. At CCOW, we don’t work on Fair Trade because we think it’s the only way for communities to flourish, or because it always works perfectly or is the right option in every situation. We work on it because in a world replete with unjust structures, it can offer a form of cooperation that helps people who have experienced injustices build something better for themselves and those around them. The emphasis it places on the dignity and worth of each human being involved in economic activity is something which Christians recognise as important for all aspects of economic life. The emphasis it places on overcoming exploitation responds to the prophetic calls throughout the Old and New Testaments for justice in trade and labour relations. This doesn’t just benefit marginalised producers: it helps us, too. As Christians we want to live out love for God and neighbour in our daily lives. Fair Trade reminds us that caring as much as we can for the people behind the products we use is part of that. And it helps us to make choices – to the extent that the options available to us and our incomes allow – that reflect our desire for people to flourish and for our world to be more just. So much around us tries to focus us on ourselves – “you want this” “you deserve it” – and encourages us to see things as “product” rather than as items whose history has consequences for those involved in production and for the environment. We need everything we can find that helps us recognise, reflect on and make decisions based on those consequences and our faith. We need Fair Trade.